Photonics West is the place-to-be; the world’s largest multidisciplinary event for photonics took place this year from 31th January to 2nd February 2017 at the Moscone Center of San Francisco (USA). Every year, over 1300 companies exhibit and 9000 visitors come to hear the latest research and find the latest devices: smart manufacturing and « industry 4.0 », autonomous vehicles, medical innovations, telecommunications, the Internet of things…Photonics is everywhere! Some very good opportunities for our SMEs! Photonics Bretagne, introduced for the first time as Photonics Innovation Hub, welcomed many visitors on its booth located on the French Pavilion organised by Business France. Our activity ranging from business development for our members to the production of specialty optical fibres and components, by our Research and Technology Organisation Perfos, was advertised. This dual expertise and the corresponding customised services have attracted more than 100 qualified leads. 10 SMEs located in Brittany – BKtel Photonics, Cailabs, iXblue, Le Verre Fluoré, Oxxius, Quantel Laser, SelenOptics, Keopsys, Lea Photonics, Yenista – and Alphanov, Amplitude Systèmes, Azur Light Systems, GLOphotonics, Leukos, mirSense, Novae and Thales, a total of 18 cluster members, also exhibited at the show. Moreover, some of them and 2 other members, Tematys and EVC, participated to conferences. Alongside the event itself, several side-meeting/visit! After visiting the BIOS exhibition (the largest biophotonics, biomedical optics, and imaging event) on the Sunday, Photonics Bretagne participated on the Monday to the visit of the NASA Research Park in Mountain View with a selection of 15 French companies. David Méchin, director of Photonics Bretagne and VP International for the CNOP (Comité National d’Optique Photonique) also presented the French Photonics at the IOA (International Optoelectronics Association) meeting gathering most of the countries with photonics activities. A SPIE cluster meeting, the scientific conference, a Tech meeting organised by the French Tech Hub in San Francisco and Business France, and the traditional cocktail organised on the French Pavilion during the exhibition completed a busy week for Photonics Bretagne and its members! 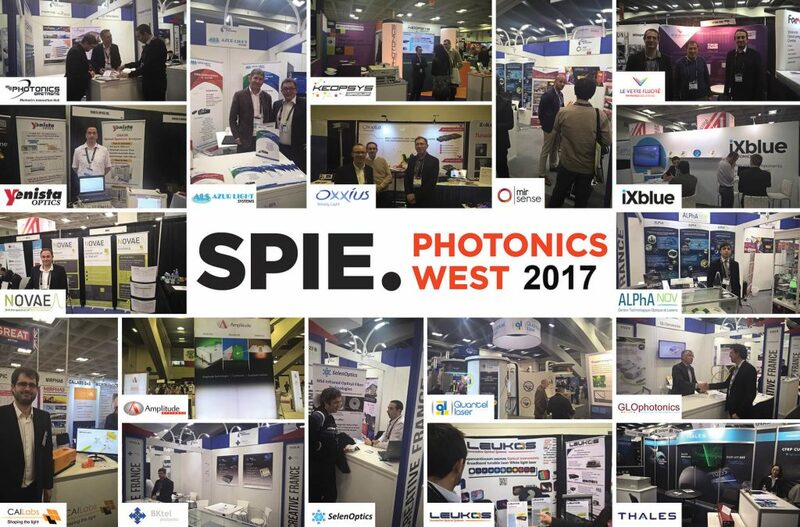 We can already confirm we’ll attend Photonics West 2018 so, see you next year in San Francisco, from 30th January to 1st February 2018!